Agreement which sets out the conditions in which an Agent engages an Artist in respect to different types of entertainment and performance commitments procured by the Agent. This contract is 5 pages long, and includes a free Agent-Hirer Promoter / Venue Contract. This agreement sets out the conditions in which an agent engages an artist in respect to different types of entertainment and performance commitments procured by the agent. 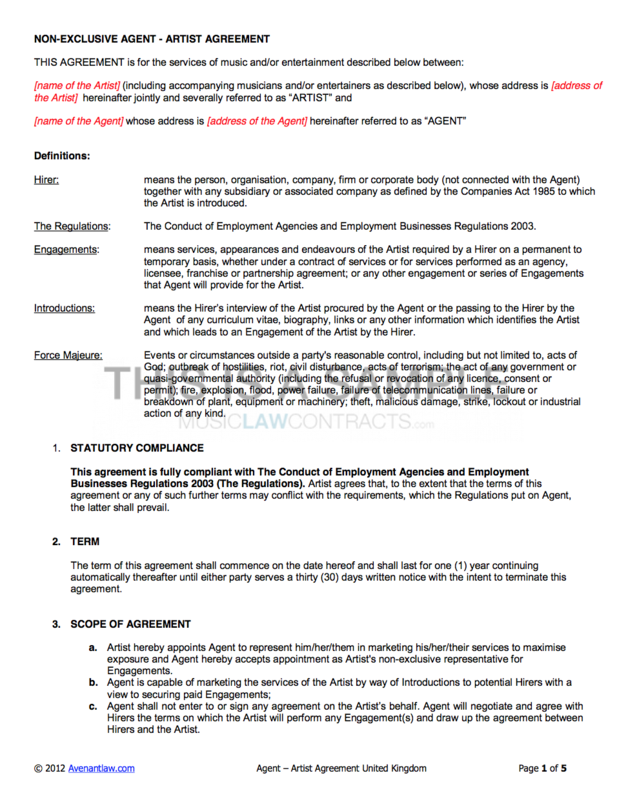 To comply with the 2003 legislation ‘The Conduct of Employment Agencies and Employment Businesses’ such engagement could not be made on a exclusive basis and therefore the artist is not prevented from working with other agents or even directly with hirers that the agent has introduced to the artist. This agreement is useful for booking agents looking to work with artists non-exclusively, earning a commission (typically 10-15% of gross revenue) for engagements they help procure during the term (usually one year) and for a period thereafter (defined in the sunset clause section). One of our kids just got the part of Simba in the West End production of Lion King so I just wanted to say thanks for all your help with the agency contracts.